We were woken very early with the crow singing at about 4am! We stayed put until it was time to get up and then as we were about to go and breakfast, saw a red squirrel stealing food from the bird table. 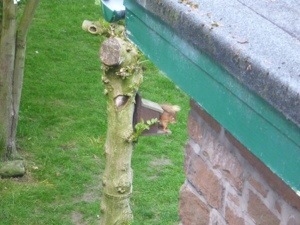 It was lifting the lid and fishing out the nuts. Very sweet to watch it! 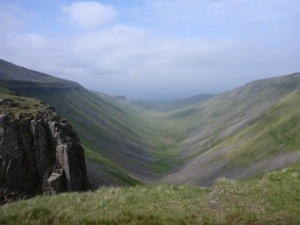 We left the youth hostel at about 8.30am and almost immediately had 600 metres of climb to get us onto High Cup Gill which is very dramatic scenery. It is a valley caused by glacier action eroding the rock. 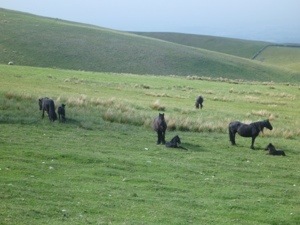 We passed a group of wild horses with their foals early on our path up……black and tiny foals. 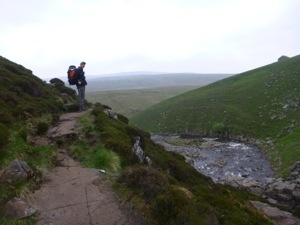 The terrain underfoot was very good in the morning and we followed the river for some time. We had a packed lunch from the youth hostel today and we ate it behind a wall, out of the wind. Only sheep grazing quietly to join us today! We skirted around another military danger area, this time Warcop and heard the guns firing in the distance. Jon keeps remembering long past exercises when he tramped these hills in combat kit. We have seen plenty of bird life. Lots of Peewits and Curlews wheeling around us to ward us of their territory and several families of Grouse with lots of tiny chicks, some not quite up to flying and only two months til the start of the shooting season for them to get fat. Steep clamber down the sides of the falls and then equally difficult along the side of the river for a couple of miles. At last, the YHA came into view across a field of cows with “Bulls” notices on the gate but we soon crossed the field and climbed the last hill towards a cheery welcome and a hot shower. No Internet of cell phone signal but curry on the menu for supper! This entry was posted in Uncategorized by katirawa. Bookmark the permalink. I look forward to seeing all the photos when you get home. Must go and track your route on Mr Google!